Want to be notified of new releases in WouterVanNifterick/C-To-Delphi? This tool will convert most of your standard C code. . It contains a split view, with C on the left and Delphi on the right. The Delphi code gets updated in realtime when you edit the C code. 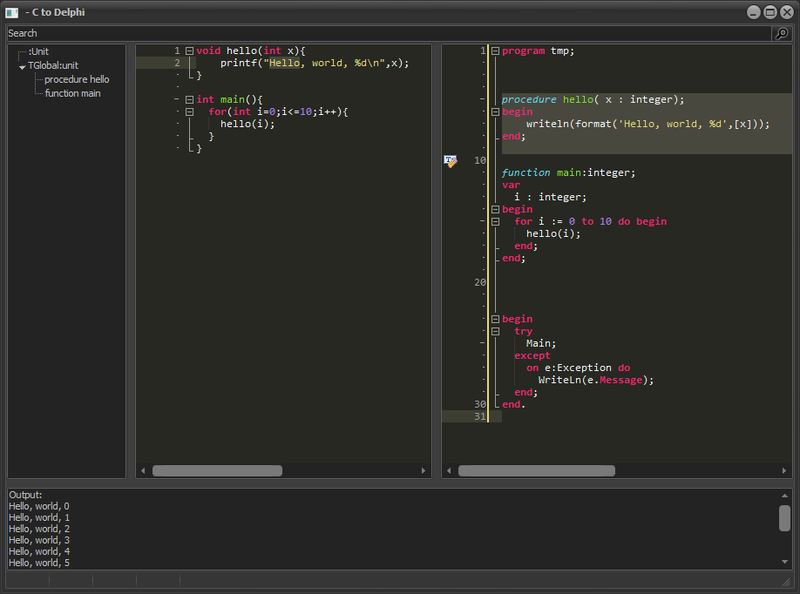 The editors are kept in sync, so you can easily find how a specific piece of code was converted. You can drag/drop multiple C files to the application. It'll find the .h files that belong to it, and convert all to .pas files in the same folder. If function main exists, a program will be generated. Otherwise a pascal unit with interface/implementation sections.